3 Reviews and 1 interview. The next 2 posts will review 2 books by Tom Rath that are essential reading for anyone involved in employee engagement. The fourth post in this series will be an exclusive interview with Tom Rath about his work. Get Friendly. In Vital Friends: The People You Can’t Afford to Live Without Tom Rath makes a strong case for the key importance of creating, building, and fostering friendships at work. Employee engagement is greatly enhanced when employees have strong friendships at work. Only about 30% of employees say they have a best friend at work. Only 20% of employees dedicate time to developing friendships at work. Under 20% of employees consider their boss to be a close friend. Quick management action to foster friendships. When managers discuss friendship with employees on a regular basis, it almost triples the chances of employees having a best friend at work. Not all friends are the same. I encourage you to read the book to learn about the various types of friendships: Builder, Champion, Collaborator, Companion, Connector, Energizer, Mind Opener, and Navigator. Take care my friend and take care of your friends. 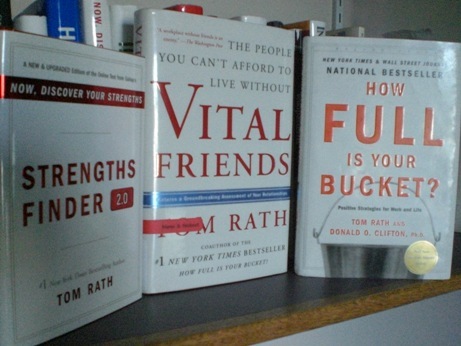 Next Book Review: How Full is Your Bucket.